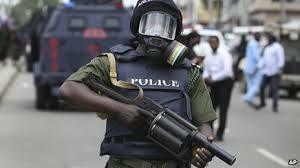 A mobile Police man attached to Erico Belisima Hotel on Olowologbon Street, along Akowonjo- Egbeda Road in the Alimosho Local Government Area of Lagos State, on Thursday, has killed a youth in the area. The youth, simply identified as Niyi, according to eyewitnesses, was said to have gone to the hotel to locate someone indebted to him to the tune of N5 million and was allegedly lodging in the hotel. Niyi and his friends allegedly laid a siege outside the hotel gate apparently to ambush the debtor on his way out. Their presence had attracted one of the staff of the hotel who queried their presence at the gate of the hotel. It was gathered that rather than explain their mission to the inquisitive staff, Niyi and his friends allegedly descended on him, beating him to stupor. It was the staff’s cry for help that attracted the mobile policemen attached to the hotel. The policemen then demanded why they were assaulting the hotel staff. The altercation, according to a source snowballed into a fierce argument. Angrily, one of the Policemen instantly shot Niyi on his leg. The crowd, who were shocked that the Policeman could use his arms over mere argument, ran for dear lives. The Policeman was alleged to have giveninjured Niyi a hot chase and shot him this time in the head killing him instantly. Niyi’s wife was recently delivered of a baby. The news of his death spread like wild fire. Angry youths in their hundreds had stormed the hotel causing collateral damage to the structure while about five cars said to belong to customers in the hotel, parked inside and outside the premises, were vandalised. The angry youths also attempted to set the hotel ablaze, but the quick response of the men of the Lagos StateTask Force, Rapid Response Squad (RRS)and other units of the Lagos State Police command, prevented them. When Daily Sun visited the area, the heavy presence of Policemen brandishing rifles were on Olowologbon Street where the incident happened. As at the time of filing this report the vandalised cars and some of those who were arrested have been moved to Shasha Police Station. Although the numbers of Policemen had reduced the Area Commander Area M command, Idimu, Austin Akika, an Assistant Commissioner of police was at the crime scene. When contacted, the Lagos Police Command Image- Maker, Olarinde Famous-Cole confirmed the incident and said investigation was ongoing and that he would get back to newsmen after he must have been briefed by the Divisional Police Officer of the Area. We're in hurry to develop Edo - Dep, Gov.